There’s no better way to enjoy the summer than having to unwind outdoors. Research says that being around green or outdoor spaces improves quality of life, general health and well-being. Just follow these four steps- Ideation, planning, buying what you need and executing your plan; at the end of it you’ll have an attractive outdoor set up that complements your space and mood. Below are some suggestions for a better outdoor set up. Ideation for setting up outdoors: Outdoors means umpteen numbers of options. Using your wide imagination, you can enhance the beauty of your outdoor space. 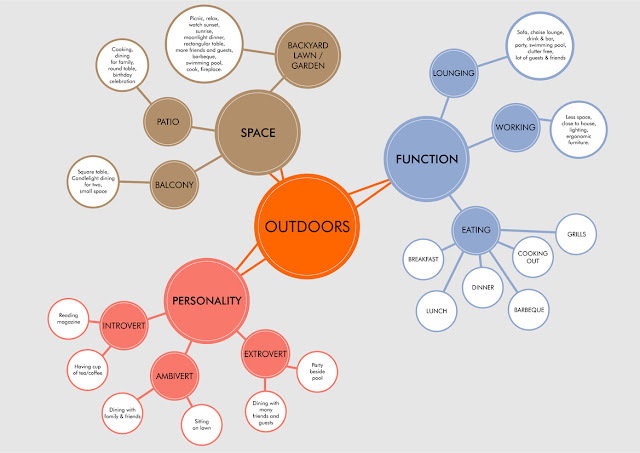 Here's an info-graph giving you an idea of outdoor possibilities. • Do you prefer to spend time in your outdoor space with family, friends or in solitude? • What times of the day do you like to use your outdoor space? • What will be the purpose of your outdoor space be- in terms of dining (breakfast, lunch, and dinner), cooking, lounge, causal seating or a combination of these? • How do you want your outdoor décor style to be? • Do you like the feeling of sitting outdoor in open space, or prefer a more sheltered space? 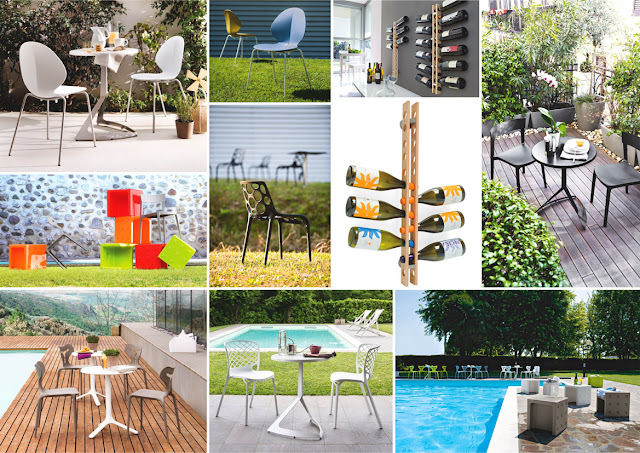 • Do you want strictly outdoor furniture or furniture that can be used for both purposes – outdoor and indoor? • How important is privacy to you? Buying outdoor furniture: Establishing a tone outdoors with upscale furniture is vital. While choosing outdoor furniture you must check for weather-resistance, resilience, robustness, convenience, durability and comfort. Mix of fun and functionality is what outdoor furniture should be. Purpose: Know the purpose – whether you want the furniture for dining outdoors, cooking, casual outdoor sitting, relaxation, enjoy personal space, lounge or partying with friends and guests. If you want to use them both indoors and outdoors, then consider lightweight furniture so you can easily move them whenever you want. Once you know the purpose, you can effortlessly choose the furniture you want. Material: If you have a sheltered outdoor seating then you can go for upholstered chaise lounge or sofas, but if you don’t have protected outdoor space then your upholstery will be damaged due to direct sunlight. For open outdoor spaces, plastic furniture is the best option. The reason being they are trendy, glamourous, befitting any outdoor look, weather-resistant and designed to withstand natural catastrophe. Among other furniture, plastic has a wide array of choices in terms of colour, shape and size. The Italian brand Calligaris has an extensive outdoor furniture collection. Glass is another type of furniture which is not recommended for outdoors but some insist upon having them to get an opulent or chic look. If that’s the case, make sure you have the high grade quality that can bear the brunt of accidents and breakage. Wooden furniture is also another option you can consider for outdoors. Coffee tables, foldable tables or side tables are functional as well as convenient for outdoors. Also, choose furniture that needs low maintenance because there is a high chance of them getting wet if they are next to a pool and dirty from being outside. Style: Design your outdoors to coordinate with the style of your home keeping in mind comfort. Decide what style you want, for instance vintage, traditional or contemporary look, or the set up you want in terms of casual or formal, and also the tone. Once you’ve planned the furniture, make sure there is a seamless natural transition from your indoor set up to outdoors. These acts as an extension of your interior and you get a valuable extra room. Shape: Choose the type of table you want whether round, square or rectangular. Round tables give more space for seating. Square table is perfect for few people. Rectangular is suitable for those who have lot of guests and friends over their place on a timely basis. Also, make sure your furniture is adjustable and functional. Colour: For outdoor furniture, use colours that complement the natural elements. Expand your home's interior colour palette to outdoors. Semi enclosed outdoor spaces that are immediately adjacent to the home should have a colour connection that flows seamlessly from one space to the next. Try mixing and matching some colourful chairs, for instance Calligaris has a wide collection of chairs in colour variety of your choice such as Area 51 and Hero. It needn't be the exact hue; a lighter tint or darker shade would work well, too. Using soft yellow light for your outdoor setting makes it warm and inviting. Using green reflects likeness of greenery in your outdoors. Similarly, there’s orange, red and white that can add a twist to your outdoor space. Whether you’re dining out or relaxing beside a swimming pool, you’ll need an umbrella for shade and to protect yourself from UV rays. Add pillows or cushions to your outdoor furniture to give it a cosy and comfortable feeling. If you like to stay up outdoors in the late evenings or want to have dinner out, consider lighting your outdoor space. Use ambient lighting for illuminating the space in general, use task lighting like lamps on your dining tables, and use accent lighting to highlight a tree or sculpture, use decorative lighting to enhance the look of your outdoor space. Thoughtful lighting is crucial to the appearance and functionality of a space. Sky is the limit when it comes to adorning your outdoor space. Add storage, art, lamps, carpets, pillows, wine cabinet, bar stools, flowers and decorative objects. This is everything you need and by incorporating these, you’ll have a beautiful outdoor space and find yourself spending more and more time enjoying outdoors.